Welcome to Alz's place .. When we were building our house both GB and I had a few 'non negotiable spaces'. Mine was a scrap room with an internal door so that if necessary, we could close it and hide the mess. Plus it had to be big. I now realise that 5m x 5m whilst a dream for some, isn't quite big enough for me, so I'm doing a lot of down sizing! I hate clutter and at the moment that's all I see .. clutter everywhere! Plus it feels to me that a square room is impractical, for the most part, so in our next home my scrap room will definitely be a rectangle. A big one LOL!!! My scrap room also had to have huge windows to let in loads of light yet have enough wall space for lots of storage. It also needed to be able to accommodate our sofa bed which, once re-covered, became known as .. I love, love, love this space. I feel so lucky, blessed and fortunate to have such a beautiful place to create in. 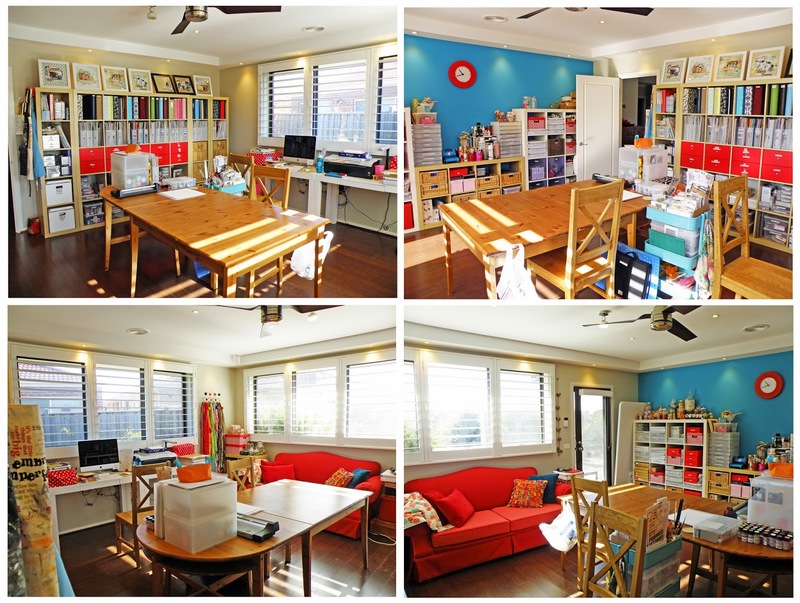 All my friends love this space and love to come back time and time again to create .. whether that be scrapping, art journaling, quilting, writing, crying. Crying? LOL, yes my room has become known as the crying room. At some point everyone who spends time in my room cries. We're yet to work out why, but its comforting to know my friends feel safe enough in my space to let their guards down. Anyways, my room isn't ordinarily this neat and tidy. LOL if you could only see it now!! But you won't. Not today anyways. Stay tuned though because as I get this room organised I'll be sharing tips on how to organise your stash and other bits and pieces. Plus I'll be selling a lot of products so you'll want to stay tuned for those. That's it for me today but like I said .. stay tuned! Ribbons are pretty. Generally they're not expensive. They can be used across many different crafts. You can tie a pony tail with them or wrap a gift. 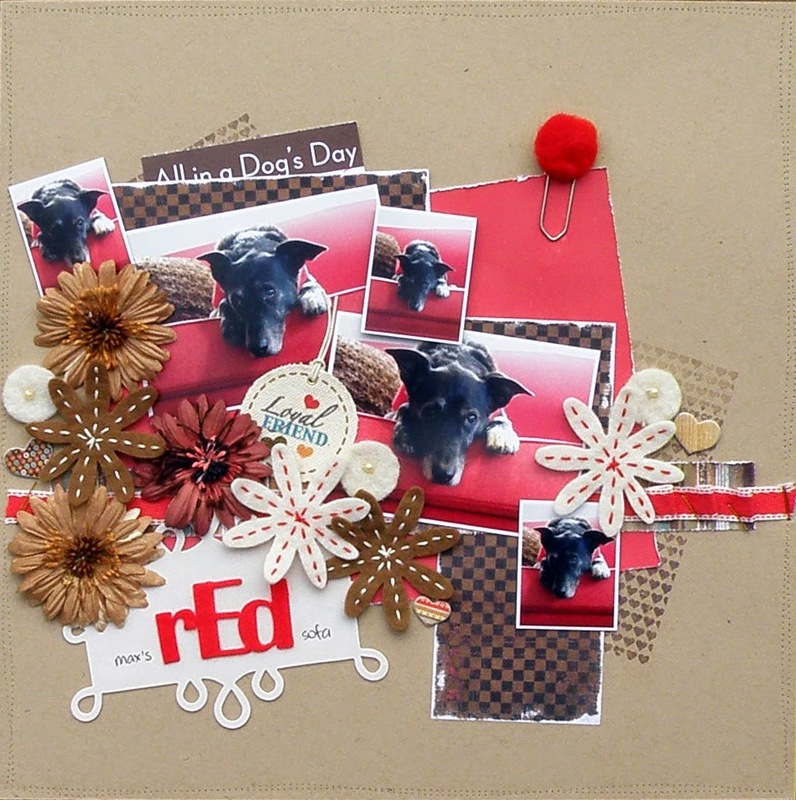 As scrapbookers and card makers we adorn our projects with them. We collect them. We like pretty things. Before we know it, we have more than we know what to do with. How on earth are we supposed to store them? When I first started paper crafting 16 years ago, I didn't have or use that many ribbons that storage was an issue. That all changed about nine years ago when I started scrapping, especially as ribbon was so 'on trend' at that time. Not only was I buying it at a frenetic pace, I was participating in ribbon swaps on the old Scrapbooking Memories forum! Suddenly I needed storage solutions. Initially storing them by colour in zip lock plastic bags worked. Then those bags were placed in a 12x12 zip look bag and Bob was indeed my Uncle! I fast outgrew that storage system and invested in several jars from IKEA and stored them every so prettily on display, in jars. Pretty quickly the Prima flower revolution took over both the ribbon jars space and the ribbon jars themselves. So then it was one colour per 12x12 zip lock bag, all stashed in a box. LOL just as I thought I had it under control, I became the projects coordinator for an online store specialising in .. wait for it LOL .. ribbon!! What was I? Yep! Crazeeee! My new dilemma? Keeping my online store ribbons separate from my 'old' stash so that I wouldn't get them confused. So I ended up with two identical systems running but in different ziplock bags and boxes. It was insane. Then we decided to put our inner city home on the market and move to the suburbs. Which meant sorting out my stash and putting a lot of it into storage. At that time I didn't have my own room so I was set up in the vestibule. It wasn't ideal as it was a high traffic area but it worked. Anyways lots of ribbon (and other stash) went into storage to help de-clutter the house for sale. The house sold, we moved to the suburbs and rented whilst we built and then eventually moved into our new home. Those original boxes of stash were never unpacked and I continued buying ribbon!!! We've been in our new home for four years now and I'm still battling the 'unpacking of the stash war' but I have organised my ribbons! All of them. I would conservatively estimate that I had at least six times this amount of ribbon so as you can imagine a lot of culling and selling has been going on. I still have heaps of beautiful ribbons to sell and donate but that's another story! 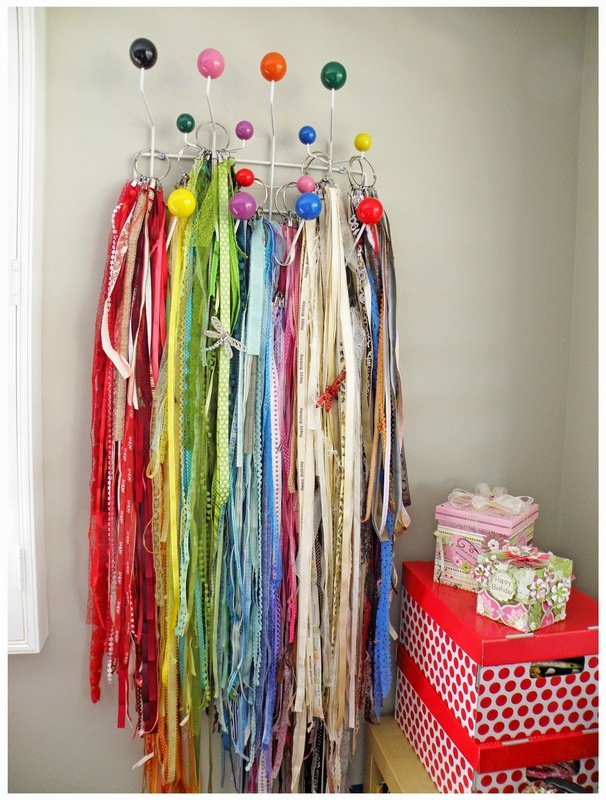 I cannot lay claim to coming up with this brilliant idea for storing ribbon. An old friend excitedly showed me how she had stored all her ribbons with these nifty IKEA curtain clips (one colour per clip) and then put all the clips on the one hinged circle 'thing'. Her ribbons looked so, so pretty I knew that I would have to do the same with mine, albeit with a lot more clips and hinged circle 'things'. You can pick up the clips from the curtain department at IKEA .. they're called Riktig and for $3.99 you get 24 in a pack. Even if you need two clips for each colour, one pack of Riktig(s) should cover you. 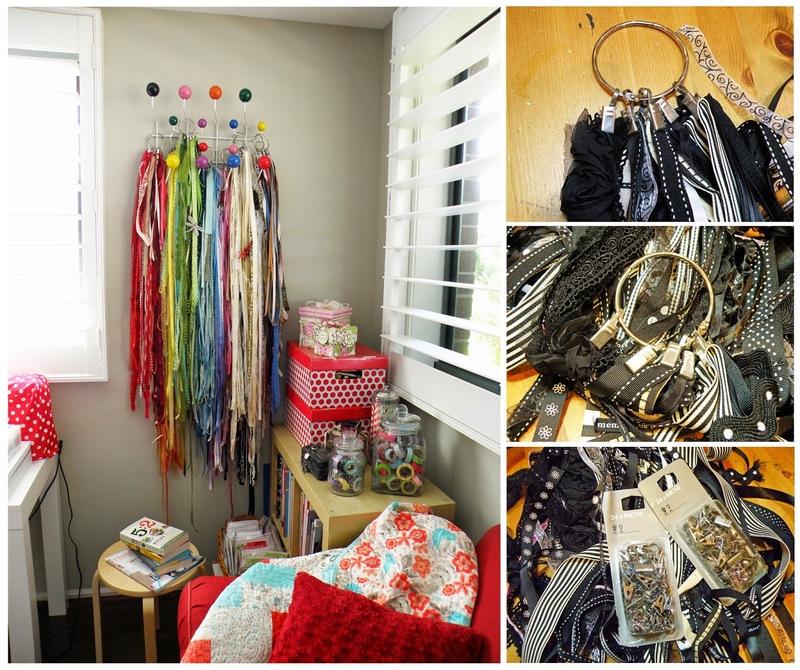 My next dilemma was where to hang all my prettily organised ribbons. I'm a huge fan of designer furniture but have champagne tastes with a beer budget LOL! Nonetheless I found this fabulous Replica Eames Hang It All at Matt Blatt and instantly knew it belonged in my scrap room and even exactly where. Side note .. these are on sale for only $39 until the 2nd of November so if you want one, you'd best buy it now. If you don't like the original, bright, fun and funky colours, it also comes in a beige (which we have in the bathroom for hanging towels, LOL just to be different) and black. So that's it. That's my ribbon sorted. Being on display it brightens up an otherwise boring corner of my room so its the type of storage that serves as both interior decor and functional storage. Whenever I want a piece of ribbon I take my project and my scissors to the ribbons and select and cut what I need. Or I'll just grab a ring and bring it to my scrap table. They don't get overly dusty. Nothing that a 'quick flick' doesn't fix. Besides being a tactile person its lovely to run my fingers through the ribbons from time to time. Oh and just in case you wanted to get really up close and personal with my ribbon storage system here's another pic for you .. Finally, as an ode to my ribbon fetish days, I'd like to share a layout or two from when I was the projects coordinator for the online ribbon store ..
LOL the above layouts are practically antiques!!! Anyways that's it for me today. Til next time .. happy scrapping! WOW Alz this looks amazing and so neat and tidy, I loooooooovve your space. Looks fantastic! Looking forward to hearing your tips.